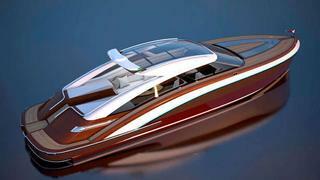 Miami, Florida-based Luiz DeBasto Designs and Hodgdon Yachts of East Boothbay, Maine, have released an innovative tender design concept - the Onyx 41. From touch screen controls to remote monitoring, Onyx is designed to set a new standard of technology applications in a yacht of this size. A host of innovative features would include a self-deploying integrated fender system, built-in dock line handling, and user-friendly features including hybrid-electric propulsion and joystick steering are designed with the owner-operator in mind. On deck, the open-air concept, semi-enclosed deck lounge opens dramatically to the outside world with a multiple-panel, sliding skylight roof. Integrated furniture runs nearly the full length of the available space, offering ample stylish seating and lounging areas. Onyx is expected to be built in very limited quantities for the most discriminating yacht owners.